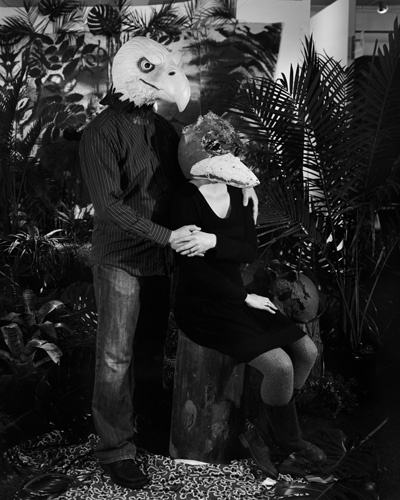 Heather Cantrell, A Study in Portraiture (Samantha Fields & Andre Yi), 2010, black-and-white photograph, 10 x 8”. Since 2001, Heather Cantrell has been using portraiture to explore status and identity, as well as intersections between photography, painting, and performance. In 2008 she began to turn her camera on denizens of the art world, creating an ongoing series titled “A Study in Portraiture”; the first two “acts” of this project include images taken in Cantrell’s home studio and in galleries and art fairs in Los Angeles, New York, and London. The numerous and varied subjects in these photographs and traveling exhibition of her works suggest that artists, collectors, and the like are not so different from other folks when it comes to being unable to resist the whimsy of seeing pictures of themselves. The latest addition to the series, “The Mirror Gaze,” adds a welcome degree of mystery. For these works, Cantrell set a mirror behind her sitters so that she would be reflected in each portrait, masquerading or partially hidden in the background, complicating the identities and roles of subject and artist. Cantrell also makes use of masks, which tie the pictures more directly to histories of theater and performance while offering collectors and others portrayed a chance at disguise. Though actual portrait studios, backdrop and all, were prominent in earlier phases of the project, they are notably absent from this show, which allows the photographs to become the focal point rather than a seeming residue of performance. The uneasy sense of wandering into a roomful of extended family portraits remains, but seeing Cantrell’s subjects masked, visually anonymous (although the works’ titles name the people depicted), creates a more direct, and more leisurely, viewing experience. We are not confronted quite so insistently by the camera’s selective invitation—which extends, after all, only to those in the art business. With this exhibition, a project that initially walked an intriguing (if thin) line between analysis and promotion has matured and become something deeper. Here, the boundaries between who is pictured and who is not begin to soften, and, by extension, broader questions about the nature of inclusion and exclusion percolate throughout this intimate collection of portraits.